Summer is in full swing, and for most of us, that means no more textbooks! With all of our study materials on the shelf for a few months, there's extra time for more exciting books. My to-be-read pile resembles an unsteady game of Jenga, but I keep balancing titles on top. I always plan to tackle the stack in summertime, but often weeks go by, and I find myself still stuck on the same book. This year, I wanted to shake up my summer reading routine. I've come across a few reading challenges in the past, but I thought it would be fun to put together an official Fangirl Initiative Summer Reading Mission! Should you choose to accept these classified orders, you will be embarking upon quite the adventure. A word of warning before you undertake this task: Reading is not as safe a pastime as some would say. It sends you into dangerous worlds, pits you against villainous characters, causes intense emotional strain, swallows up hours in a single gulp, and either dries your eyes from intense staring or floods them with unquenchable tears. However, the merits are boundless. You will explore new lands, encounter diverse characters, soar with feelings, conquer boredom, and have your eyes opened to worlds you never imagined. Below is a list of bookish criterion to use as prompts. For most prompts, a recommendation or example is included. Use the suggested titles as a jumpstart, or improvise with all your own! With a color in the title. Check out Red Queen by Victoria Aveyard! You can read my review of it here. That's been sitting on your shelf for more than a year. I must confess, I have several novels that fit this description. My choice, though, is Hood by Stephen Lawhead. Ever since the BBC Robin Hood show, I've been interested in finding another outlaw story. Depending how this one lives up to my expectation, you might be hearing more of it. That is historical fiction. I'm planning to finish reading Lisa Bergren's Grand Tour series. The first one is an excellent story, set in the early 1900's. I'm quite excited to see where the next two books lead. I believe the time period progresses into the 20's, though I'm not sure. You picked for the cover. I know I shouldn't, but I frequently judge books by their covers. Currently, I've snagged Kiss of Deception by Mary E. Pearson. I'm hoping the story lives up to the artwork. That's first in a series. It's been a couple of years since I read it, and I've yet to continue the series, but Cinder by Marissa Meyer is a solid starting book. Involving time travel. Last month, Jaime and I collaborated on a post for 14 Reasons You Should Read the River of Time series. I just have to recommend these books again. Seriously, if you read nothing else on this list, read the River of Time. At least try the first book, Waterfall. Featuring a love triangle. I know, I know. I can hear you groaning. But admit it- a little melodramatic angst every once in a while can be entertaining. And it is possible to have a good love triangle, as Mirriam shared in this post. I got really caught up in the love triangle in the Halflings series by Heather Burch. Even after it resolved, I was torn. I'm still torn, a year later. Set in the future. My current favorite futuristic books are the Remnants series, by Lisa Bergren. Although they're dystopian, they put a fresh spin on the genre. I did a full review here. With more than 400 pages. Some books really shouldn't go over 400 pages, but thick novels excite me nonetheless. If you're looking for a story with a lot of depth and detail, grab a copy of Dragonwitch by Anne Elisabeth Stengl! Though it's part of a series, it can also stand alone. I loved the world-building and lore in this novel, and it was long enough to get lost in. Narrated by a guy. Since this is the Fangirl Initiative, and most of the books I've listed are narrated by other awesome girls, I figured we'd shake it up and bring a boy into the mix. I finished both The Giver by Lois Lowry and The Maze Runner by James Dashner recently, and greatly enjoyed the stories and the narrative style. Retelling a fairy tale. I'm easily drawn to fairy tales, but I don't always like the remixes. Alex Flinn's take on Beauty and the Beast, though, in her novel Beastly was well-done. It kept the spirit of Beauty and the Beast but added its own modern appeal. That is a classic. The piece of literature I can't stop recommending right now is Harper Lee's To Kill a Mockingbird. It's such a powerful, touching book. My only regret is I didn't read it sooner. Outside your usual favorite genres. I read a lot of fantasy, dystopian and historical, so I'm going to try getting through a contemporary story. Since it keeps popping up, I'll finally be trying To All the Boys I've Loved Before by Jenny Han. Even though it's getting a lot of attention, I don't have super high expectations, so we'll see how this experiment turns out. Each book you read can be applied to only one category. For example, let's say you read Waterfall. Technically, it could be considered historical fiction, first in a series, time travel and recommended by a fellow fangirl (me!). Rather than reading one book and checking off four items, though, you would assign Waterfall to one grouping and read three other books to mark off the rest. You can complete the challenge in any order you like. It's okay to skip up to five of the prompts on the list. You don't have to read any of the titles mentioned. You're certainly welcome to, but they were included as a guide, not a rule. I may even adjust a few from my list. Have fun! Life is stressful enough, and this challenge isn't meant to add more pressure. If something isn't working for you, forget all the rules above and do what's best for you. After all, that's what being a fangirl is about. We would absolutely love to hand out prizes of epic proportions to every participant! Sadly, we don't have delivery owls at our disposal, and carrier pigeons aren't as reliable. Thankfully, we do have internet connection. If you complete the challenge by August 30, let us know! We'll email you an awesome award certificate and some nifty bookmarks to print out, along with our applause and good wishes. In the meantime, don't forget to keep in touch! Let us know which books you're reading, and which ones you recommend other fangirls read. Tweet or tag us in photos of your TBR piles and reading selfies. 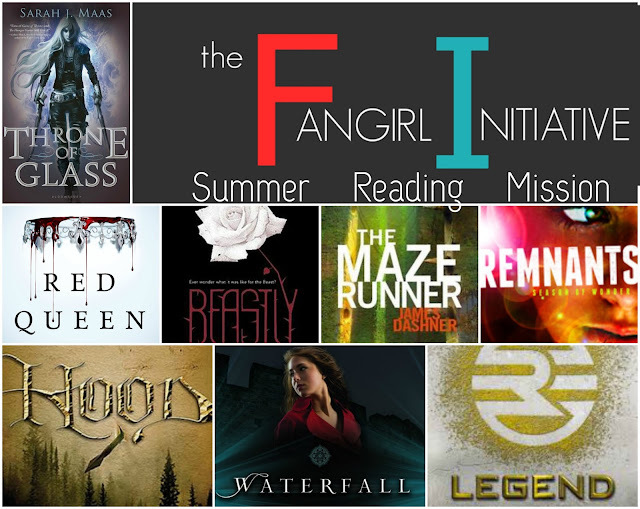 Go ahead and share this not-so-top-secret reading mission with your other fangirl friends. Now if you'll excuse me, I'm off to read another chapter. Might I suggest an unofficial bonus mission? Read a graphic novel of some sort. Manga, Marvel or DC (or both?) comic book, literary classics graphic novels, etc. Need recommendations, I'm your girl. This sounds like so much fun! I have been really too busy with my writing schedule to dedicate much time to reading, but this may be just what I need to remedy that. :) If I can make it work I will definitely do this! Thanks Sarah!